There is a function in PS that I use ALL-THE-TIME and it's called "layer comps". It's the ability to export automatically a certain configuration of layers. One of the best examples I could give is when you have a product with 50+ colour changes and you want a PNG (or Jpeg or whatever) in each of the colour. It would be way counter-intuitive to take the one colour, hide all the other colour layers, save and then repeat 49 by hand What you do is record the hide/visible status of each layer (other parameters are available) and create a new "layer comp". When you're done, you run the "export layer comps to files" and you make yourself a cup of tea (with a hobnob, preferably). Now maybe it's possible in Affinity Photo (I don't own it) and I am talking now about designer... What gives? You can do this in the Export Persona. 1 group on top containing 50 files with a different text on each. I want to create 50 files each displaying a different text, the background stays the same for the 50. 1 group on top of it, with text that doesn't change. I tried to go to the export persona, go to the layer palette here, I've put everything in a group so the export is a unique file (instead of a bunch of "assets") and hid all the unwanted text but one. I do as per the screenshot, (note, I don't want to create areas, I want the whole file) by pressing the icon at the bottom of the layers. One "slice (from item)" is created. 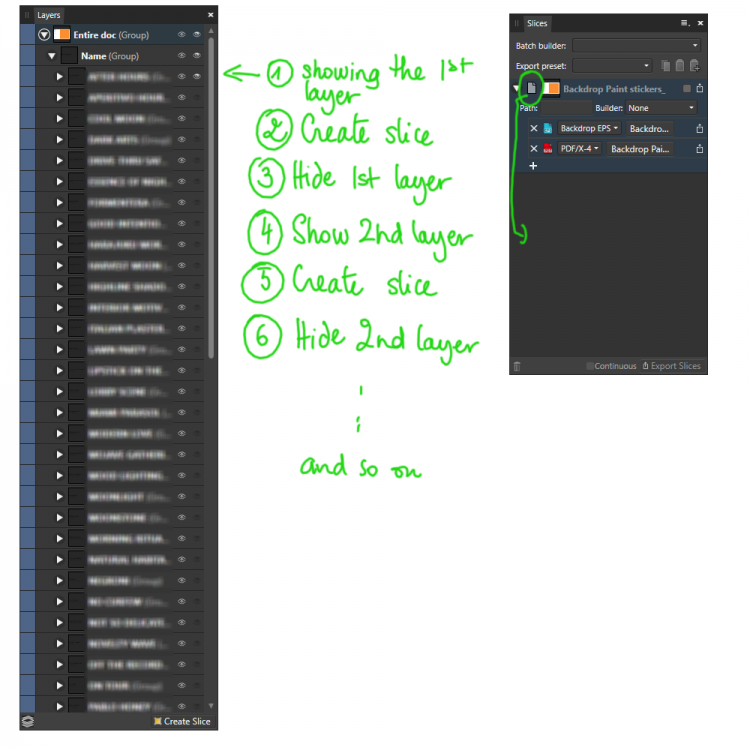 When I go to hide the first layer and show the second one, and then try to create a new slice, no slice is created, it doesn't recognize that I have changed anything because the area is the same, the content is different (that's my explanation anyway). I can't actually show you the original doc, as it's a client file but I can create one similar to show what I mean in detail. Don't hide the layers, show all the layers, they won't interfere with each other. Well, how do I show only one line of text with all layers showing? This was be being stupid alongside the user manual being either incomplete and obscure (never a good combination. Basically, my problem was with my static elements. I assumed (because I always used it that way) that the static element - since not moving - needed to be separated from the changing designs so in my file the layer stack had the static elements in the background while the changing designs where shown/hidden alternatively. Now while doing some tests I figured out that I ought to be replicating all the static elements within groups (named after my text layer) and instead of showing/hiding layers, I needed to hide and show groups instead, thus leaving absolutely no additional layers that are always showing (if that make sense). So now my 50 layers are now 50 groups, all of them containing a copy of my static elements within them. My main error was to assume that if it was meant to work, it should work with all either the needed elements to be visible (static background + 1 static text layer + 1 changing layer) or selected. The first case (visible) didn't create a different slice for each different set of layers shown (same name each time, that of the whole document), and the latter exported the 3 elements as 3 separate slices. So the final working workflow work as intended. All the elements within a group and for each group shown, I create a slice (which is luckily named automatically after that group) thus creating 50 different slices. Thanks to the thread above, I was also able to create 2 file types (in my case PDF and EPS), each going into a different folder at the export stage. Result 100 files, neatly named and saved into their respective folder. Thanks to everyone who has taken the time to answer me. And happy new year to you all!